In Madeleine L’Engle’s classic A Wrinkle In Time, she shares the story of the Murry family – specifically Meg, her brother Charles Wallace, and their quest to find their missing scientist father. I won’t recount the entire plot here (if you need a summary, here it is. Seriously, just go read the book! ), but there are two important things I want to point out – Meg struggles to fit in, and Meg is challenged to save her brother from the powerful IT…whose one power is the ability to make EVERYONE fit in. Below them the town was laid out in harsh angular patterns. The houses in the outskirts were all exactly alike, small square boxes painted gray….In front of all the houses children were playing….As the skipping rope hit the pavement, so did the ball. As the rope curved over the head of the jumping child, the child with the ball caught the ball. Down came the ropes. Down came the balls. Over and over again. Up. Down. All in rhythm. All identical. Like the houses. Like the paths. Like the flowers. Not to get all dramatic about it, but the truth is that many companies are like Camazotz. The denizens of Corporate America are all too happy to allow someone else “to assume all the pain, all the responsibility, all the burdens of thought and decisions.” Unsurprisingly, Meg, Calvin and Charles Wallace are unnerved by all the sameness. To them, it’s creepy and unnatural. Why? Because if everything is the SAME, how would you know if something is good or bad? That which moves us forward requires a lack of conformity. Progress, by its very nature, is disruptive. It interrupts the status quo. It challenges us to bounce the ball to a different rhythm from everyone else. Without disruption, we would be drones. It’s hard to embrace our inner disruptor, though. We are surrounded by people who will defend their right to a boring, thought-free, risk-free existence. And, like IT, these people are often in leadership roles. Why? Because the more you have, the harder you will work to defend it. The door of his house opened and out ran one of the mother figures. She looked wildly up and down the street, saw the children and put her hand to her mouth as though to stifle a scream. When you have chosen to trade your free will to avoid responsibility, it would appear you have also chosen to live in fear. I don’t know about you, but I struggle to work with people whose default setting is “don’t rock the boat.” That doesn’t mean I’m an anarchist – it means I value individuality, risk taking, and looking forward. I believe that what got us here won’t get us to the next level. Gosh darn it, I’m a disruptor. Know your currency: Charles Wallace, intuitive genius that he is, is eventually seduced by the power of IT – not because he doesn’t want responsibility but because IT flatters his intelligence. Many of us have trigger points or other elements that we hold dear and will defend to the (metaphorical) death. Be aware of yours and establish your personal boundaries so you don’t automatically go into defensive mode when you should be embracing a challenge. Use frustration to your advantage: In the book, Meg says, “When I’m mad I don’t have room to be scared.” She uses one strong emotion to give herself courage to ignore her fear. We all run into frustrations at work. We get angry. Would you rather sit and stew? Wouldn’t it be better to use that anger and frustration to give yourself the courage to try something new? Understand WHY disruption is needed: Meg saves Charles Wallace because she knows IT doesn’t understand love – her motive was purse, her cause just, her disruption a necessity.Change for change’s sake isn’t necessarily a good thing. It should be intentional. WHY do you disrupt? Is it to encourage new thinking and behaviors? Or are you just being a contrarian? True disruptors use their powers for good, not evil. Keep trying: Disruptors understand that success doesn’t always happen on the first try. It takes persistence, adaptability, influence, charm, support, help, failure, learnings, repetition, new leadership…all of it. But it’s worth it. We keep talking about the importance of authenticity, letting your freak flag fly, being yourself at work. If you believe in that, be open to a little disruption now and then. It’s good for you. Think disruption sounds cool? Want to explore your inner disruptor? 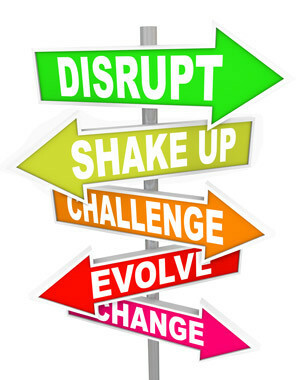 If you are in the Denver area, join us for DisruptHR Denver – a FREE event on April 9, 2014, exploring new was to think about people and talent. Visit www.disrupthr.co/denver for more information and to RSVP!